Bolivian National Flower is the Kantuta. No the Patuju. National Emblems. 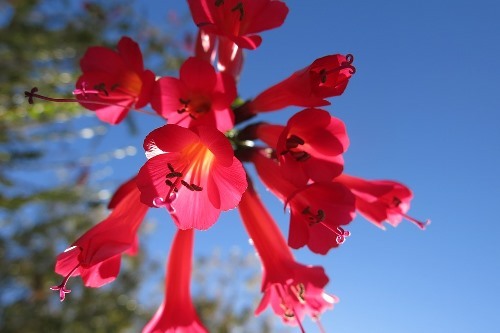 The Bolivian national flower is the kantuta. No the patujú. Why does Bolivia have TWO national floral emblems anyway? Well, probably for the same reasons it has two capital cities (sort of) and thirty official languages. Bolivia is sort of like two countries in one, and is home to MANY different native cultures. The Andes mountains run along the western third of the country and the culture in this region is mostly Aymara and Quechua. Most of the Eastern half of the country is tropical and part of the Amazon rainforest region. This side of the country is influenced by totally different indigenous groups like the Moxos, Ayoreos, Guarayos and Guaraní, and by Brazil. Traditionally, there has been a lot of animosity between the two regions of the country. That's when people don't like each other. For many historical, some hysterical, and other completely stupid reasons, people from the West (knows locally as kollas) and people from the East (known locally as cambas) just do not get along. They have practically nothing in common, other than that they all happen to be Bolivian (now). And even that, according to some people, is just a fluke because back when the South American colonies were gaining their independence from Spain somebody decided what Bolivia should look like using a map and they divided up the region using rivers and other topographical points of reference (things you can see on the land) with absolutely no regard for cultural boundaries. This means they didn't ask anyone if they wanted to be part of Bolivia, they just drew some lines on a map, and presto! Suddenly there was this country called Bolivia and suddenly you lived there - whether you liked it or not! So what does all of this have to do with the national flower of Bolivia, or should we say, both of them? Well, by having two, national leaders thought they could help promote a sense of national unity and fairly represent both regions. I'm not sure they succeeded. At times it seems like it's only caused more arguing. Kollas and cambas don't get along any better now than before I think. "...they shall always be represented crossed over each other with one stem of the Kantuta Tricolor leaning toward the right and one reed of the Patuju Bandera leaning toward the left, as an interlaced symbol of union between the regions, ethnic groups, cultures, and natural resources of the Republic." This, because the kantuta is native to the western region of the country and the patuju is native to the eastern tropics of Bolivia. Both are red-yellow-green in color, like the Bolivian flag. Because it is from the "left" (or western) side of the country, the kantuta leans toward the right (or East) and the patuju, being from the East, leans to the West. This is supposed to mean that they are extending a sort of a welcome or greeting to each other - like when you want to be someone's friend so you politely ask them, or you shake their hand - something like that. The kantuta's scientific name is Cantua buxifolia: pronounced (KAN-tew-uh)(from the Quechua name of the plant "qantuta"), and (buks-ih-FOH-lee-uh) meaning "with leaves like a boxwood". It grows normally in cooler regions like the Andes. It is a tiny plant and very fragile. It's also very hard to find anymore. The Incas have an interesting legend about the kantuta. 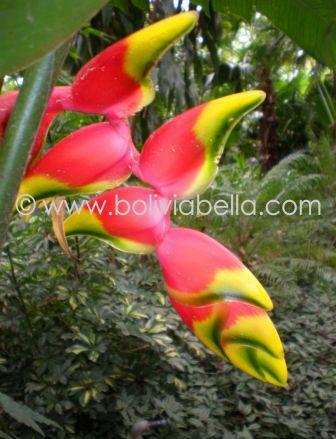 The patuju (Heliconia rostrata - pictured above), on the other hand, is very large and proliferous. (That means it grows all over the place and it's not hard to find at all in the rainforest - it's even all over people's gardens here in my city). But, it grows only in parts of South America, Africa and Madagascar, and is related to the bird of paradise plant, although most birds of paradise grow upward, while the patuju grows downward. Heliconia (comes from Mount Helicon where the muses from those myths you read about in school used to hang out) and Rostrata "to have a beak" cuz that's sort of what it looks like. Hummingbirds love it! There is another type of Patuju (the Patuju Gigante) which is a gigantic HERB that grows here in Bolivia as well. It is very common in the rainforest and looks like an enormous fan growing out of the top of a stalk (thick as a tree trunk). It's easy to confuse it with a palm and it doesn't flower much. That variety is NOT Bolivia's national flower.